Hello everyone. Been a while, eh? Well, the intent of this site was always to be active when the show was running, and kinda dormant when it wasn’t, so I suppose this is the first time we’ll find out whether the experiment’s worked – i.e. if people come flooding back to chat Who with us now that it’s ON TELLY AGAIN. So, yes. 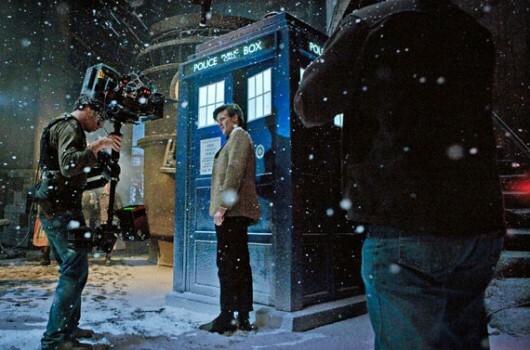 Merry Christmas Eve, and in honour of the festive occasion, and the Eleventh Doctor returning to our screens, I thought I’d get in early with the discussion post – so, feel free to post your hopes and thoughts and speculation about the episode in the buildup, and comment on it during (if you really are sitting there on Christmas Day with your laptop in front of the telly) and afterwards. But remember, if you’ve read about the episode or even seen it at the recent screening, please don’t post any spoilers/details until the episode has aired. Yay! A Christmas special with a cast-iron justification for being set at Christmas! Doesn’t mean I’m any more impressed by it snowing, though. The TARDIS dematerialising from the cupboard at the same time as it rematerialised in the recording was immensely satisfying. I’ll scratch my head about the wibbly-wobbly later. That was brill. Moff firing on all cylinders as usual (the Christmas Future reveal was a particularly great moment). And it should rightfully shut up all the cynical sods complaining that his eps have no “heart”, because by God that was one of the heartiest NuWho eps ever produced. Can I just say, Toby Haynes needs to direct a lot more Who episodes, because all of the ones he’s been involved with have been flpping gorgeous and practically filmic (eps 1 and 2 of the next season look to be the same). To my kind the single best Christmas special so far and at the moment i’m inclined to say one of the best overall episodes since 2005. Lovely example of charecter over spectacle. Less ‘special’ but more ‘Christmas’. To certain extent, the story was a prisoner of the overall shape of the series; we’ve just come out of The Big Bang, and given that Moffat obviously prioritises explosive openers more that Davies did, 6.X had to show a certain restraint of ambition. 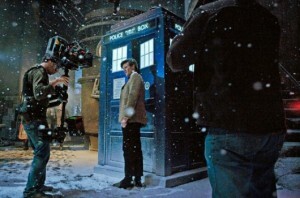 I think the reason why myself and some others were slightly underwhelmed is that A Christmas Carol is more a restatement of the showrunner’s vision for Doctor Who than an advancement of it, for the benefit of viewers who might have drifted away from Series Five under the distractions of summer. We’ve got the fairytale aesthetic and tone writ large in the off-world setting (Wasn’t the moment when the fish attack the Doctor for trying to rationalise the plot lovely? ), a key role in the story for a child, clever use of time travel and the ‘finished article’ eleventh Doctor proudly on show for all to see. What was particularly interesting was that the budget restrictions obviously haven’t been slacked that much for the flagship episode. The Moff got his beautiful flying fish, but at the price of economy elsewhere. The story has the bridge of the starliner, Karzik’s study, his bedroom, the cryo vault and Abigail’s kitchen. That’s a quite a small number of sets when you think about the scale of the later RTD specials. I’ve never been that fond of the Christmas specials, and would probably put this on a par with The Next Doctor as my joint favourite of a weak crowd. Matt Smith was great, the boy was excellent and Karen Gillan was practically absent. The only niggle I’ve got is that the “clever use of time travel to alter history” worked well in _The Big Bang_; but having it again so soon felt a bit like cheating. Still, new Who is still new Who; and the trailer for S6 looks excellent (complete with more explanation of The Lodger’s TARDIS-lite, it seems). So I’m a week late to this party, but what the hell. I enjoyed it. I’ve watched it again since, and I’ve no real problems with it at all. The main thing, for me, is a change of pace from the RTD specials. There’s usually a mad dash/impending doom/race against time, and although we did have that in the form of the crashing ship, the hops through time diluted the rush, somewhat. All in all, though, thoroughly entertaining, and great Christmas fare.